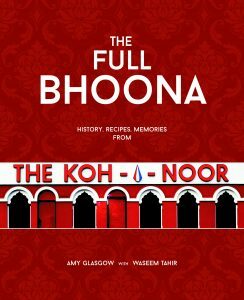 Ringwood publishing is delighted to announce the publication of “The Full Bhoona” – subtitled ‘History, Recipes, Memories from the Koh-I-Noor’ . It has been written by Amy Glasgow with a Foreword by Waseem Tahir. The Full Bhoona is the story of Glasgow’s oldest Indian Restaurant, The Koh-I-Noor; the Tahir family who founded and run it; the food they serve; and the generations of memories they have created with their many happy customers. It is also a cookbook enabling the re-creation of many of their finest dishes. Published by Ringwood in November 2018, the Full Bhoona turned out to be a very popular buy over the Festive period with many people buying it for family and friends. So well did it sell that Ringwood have sold all their copies of the paperback and it is no longer available for purchase from Ringwood, Amazon, Waterstones and other established booksellers.